Research points to developing analytic skills in marketing as the top critical success factor over the next two years. Better than half of marketing leaders said they cannot manage marketing programs without marketing automation. The gap between sales and marketing is more than just technology. 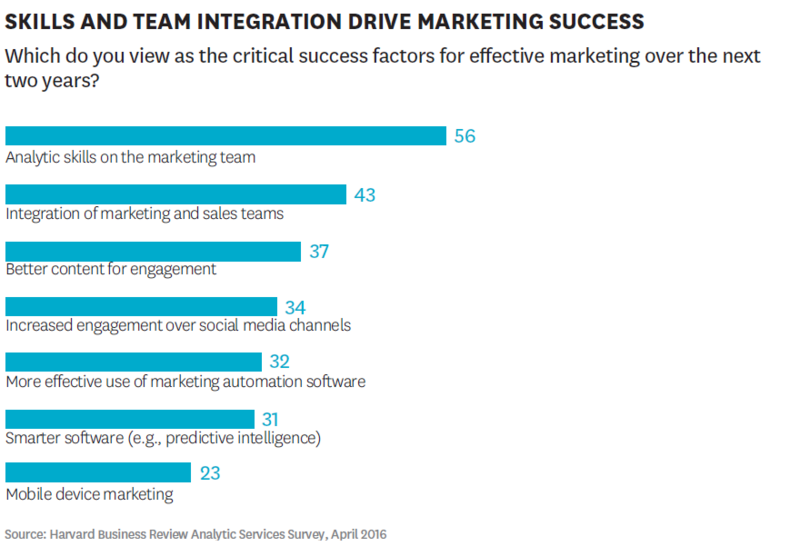 The second most important critical success factor is integration of marketing and sales teams - a company culture, leadership, talent and process related set of challenges. 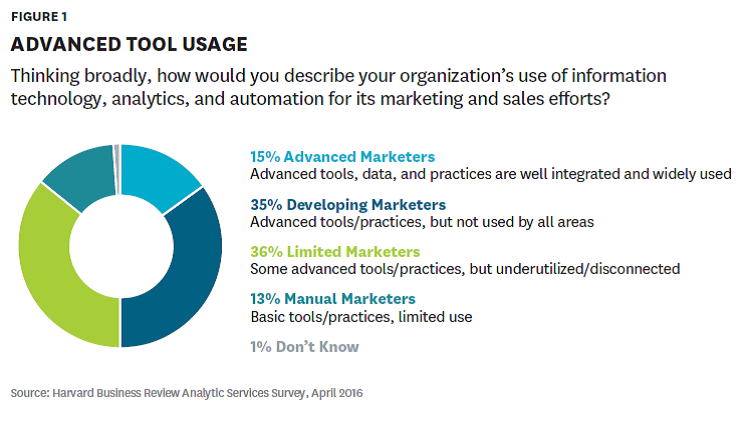 Only 15 percent of respondents have widespread use of advanced tools, analytics, and practices to better leverage data in their marketing and sales efforts. The driving change is that the center of gravity in commerce has shifted from sellers to buyers. In the age of the customer, information is easily accessible to consumers on a variety of channels. And these channels include social channels where the level of trust and advocacy can highly impact the buyer during their purchasing decision process. 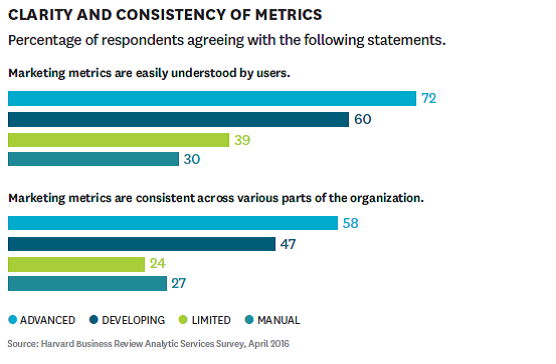 Regardless of B2B or B2C, customers expect companies to deliver personalized, timely and relevant services - they expect businesses to know them. Successful marketing organizations use data to personalize delivery of content on the right channels, at the right time, and to the right audiences. And the use of technology extends far beyond online commerce to include all phases of the customer journey, for all industries and business models. Advanced marketers are six to eight times more likely as manual marketers (those with limited use of the most basic marketing technology and practices) to manage customer relationship. 47% of marketers without marketing lead qualification systems simply pass all leads to sales, unqualified - this is an incredible waste of time for sales, forcing them to chase meaningless activities instead of spending time strengthening relationships with customers and qualified leads. 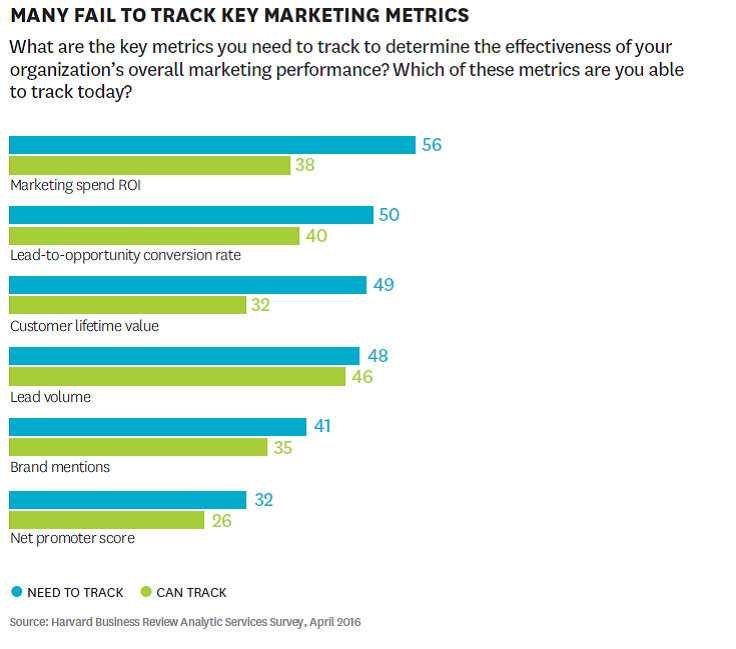 46% of sales lose track of leads when they partner with manual markers, as compared to only 7% of leads that are lost between sales and advanced marketers. The research found that in the next two years, 93% of marketing organizations do plan to increase their use of technology to compete in the digital economy. B2B companies in particular will look to technology to improve relationship-building efforts based on expertise, thought leadership and trust. 71% of respondents said that ease of use is the most important attribute to getting value from new marketing solutions. But only 42% of marketing leaders say their marketing technology is easy to use. But even if the solutions were easy to use, and accessible, marketing still has a major obstacle to overcome and this is the need for analytical skills in marketing. 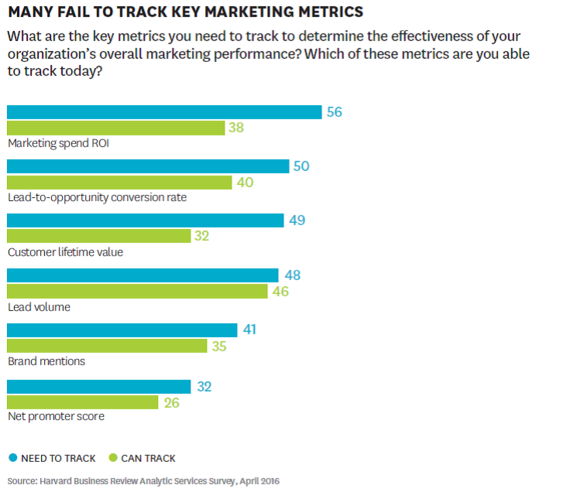 Marketing professionals need to be able to interpret data. 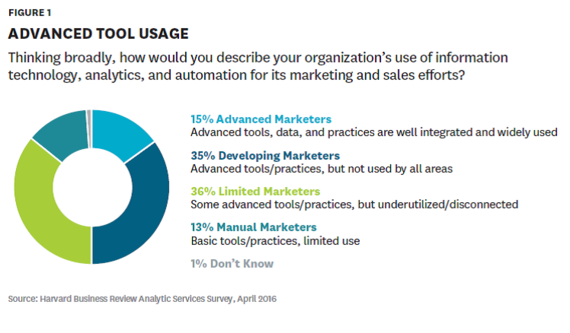 91% of marketers say today's marketers must be adept at data analytics. 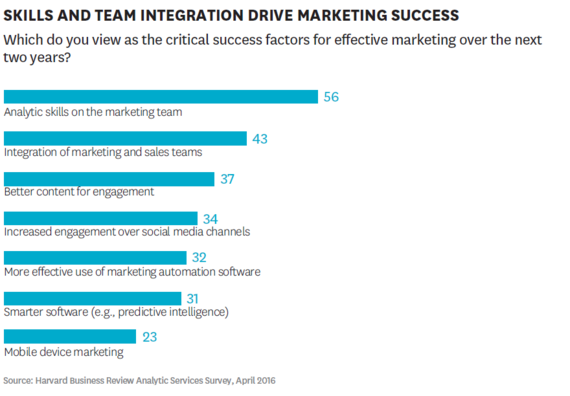 Advanced marketers are twice as likely to say their marketing and sales organizations are fully aligned. And they are significantly more likely to describe their relationship between sales and marketing as an equal partnership with high collaboration and shared goals. Selling is a team sport and marketing leaders must be more collaborative and interested in mapping marketing programs to business objectives including revenue growth, customer satisfaction, retention, advocacy, and company optimization and continuous improvements goals. The research concludes by noting that advanced marketers are able to leverage technology - CRM, marketing automation, analytics - to go from data to insights, to rapid decisions and actions, that add value to customers. 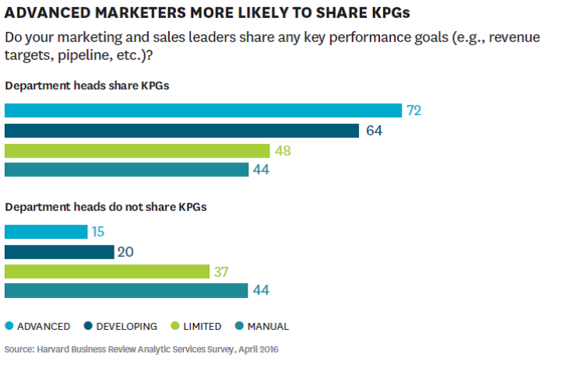 Advanced marketing leaders are also collaborative and transparent, sharing and aligning their key performance goals (KPGs) with sales, IT and other lines of business. It is important to note that only 15% of the respondents in this survey are identified as advanced marketers. There must be a sense of urgency for the other 85% of companies to achieve marketing digital transformation in an accelerated manner that helps their companies stay relevant and competitive. The companies that ignore market transitions and the changing behavior of consumers, are likely to significantly lose market share and ultimately be disrupted by their competitors with advanced marketing and sales capabilities. To learn more about high performing marketing organizations, also refer to the 2016 State of Marketing research.